Are you interested in collaborating with the European Union and partner countries? Do you want to sharpen your proposal writing skills? 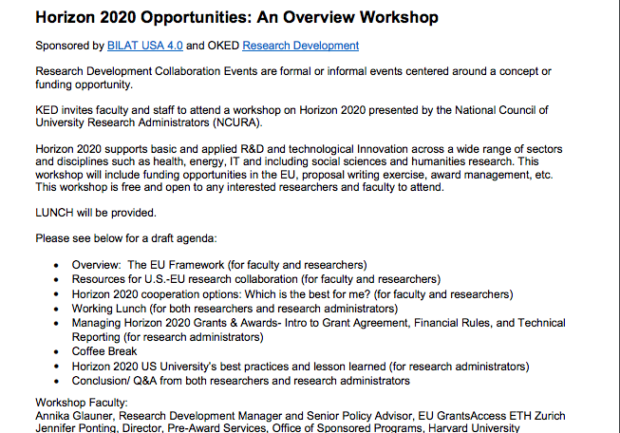 Learn about what Horizon 2020 can do for you! Horizon 2020 supports basic and applied R&D and technological innovation across a wide range of sectors and disciplines such as health, energy and IT. 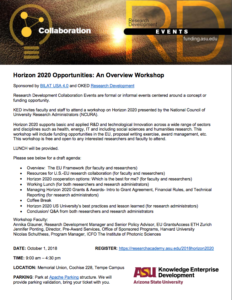 The workshop is free and open to any interested researchers and faculty. The workshop will be streamed online but not recorded. When attending the event, park at the Apache Parking structure. Parking validation will be provided if you bring your ticket. This is brought to ASU via a grant funded through the National Council of University Research Administration.